"I'm very happy to see that I can produce a performance like I did the last two weeks. That clearly makes me believe that this was just a stepping stone to many more great things in the future." "It was a great match and I enjoyed being a part of it." 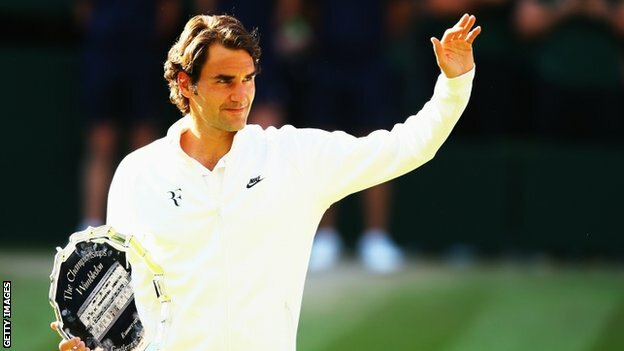 "Winning or losing, it's always something special in the Wimbledon final and something you'll remember, even more so when the match was as dramatic as it was today. I'm very pleased with the way things went throughout the match. It was a high-quality match and it was good stuff from both players. Clearly we both walk away happy from here. I mean, him more happy than I am. But still, I'm happy overall." Roger met the Duke and Duchess of Cambridge after the match but said he was too upset to hold down a conversation. "I wasn't in a great state," he said. "I was unbelievably sad at that moment just when I left the court, so it was a difficult moment for the three of us. But they were very sweet to comfort me and wish me well." This has been the best result for Roger after the disappointing 2013 and there are lots and lots of positives from here. The only negative is that 5th set, he just lost focus or temparament or whatsoever. Apart from that, this will make him believe he can do it even more times in USO or AO and the 4th set comeback will give him the much needed boost if he has to face RN or ND again in major tournaments. We can see more serve and volley and more approaches to net in the future and the thing is how calculated it is going to be in hard courts..
Good luck Roger! Have a great time with your family and see you in Rogers.. Good luck for the US swing!!! Took me a long time to digest what happened on Sunday. After such an extraordinary comeback in the fourth set it all seemed to end rather suddenly in the fifth. But it was always going to be tough to serve second in the last set, and overall, I have to admit I thought Novak had the edge so deserved the win, in spite of what I consider to be the gamesmanship of the injury breaks which came just at the moment he needed to slow the momentum, and the effects of injury disappeared pretty quickly soon afterwards. Maybe that's unfair but it's the way I saw it and I know I'm not the only one. Interesting to note that although both players gained huge numbers of twitter followers after the match, Roger gained more. To me that says it all really. A great display of real tennis from our man, and I'm very proud to be his fan. Allez Roger. After the Gulbis performance at the French Open I have been more conscious of injury time outs and do believe that some are pure gamesmanship designed to disrupt the rhythm of the game, or gain a breathing space, rather than being a genuine need. It is difficult to judge when watching on TV, but poor old Stan was so obviously feeling sick in his match, even the comms said how ill he looked and commented how he appeared to be retching into his towel at one sit down, which fortunately was not broadcast In this match Novak had a nasty fall but in all honesty I did feel he over egged it and appeared perfectly OK afterwards. It is a shame that these thoughts creep in. I hope that tennis does not sink to the level of Football with regards to Oscar winning injury performances, then hey presto the player is up and running about as if nothing was wrong! Having said that Novak did have the edge in the match and I do not begrudge him his win, but do wonder how it would have turned out if the injury distraction had not interrupted things. And, thank you for all the posts, pics, videos, etc. The other day I read a blog post made by somebody who was at the match and she said that at a change over Roger had quietly asked Novak if he was OK, something we missed on the TV coverage. As the players waited to walk on to court. Roger was standing beside the winners board and he did quickly glance over. It must have been impossible to block out the momentous opportunity that was before him. The chance to have his name on that board again. However, that fight back in the fourth set was totally amazing. It was what made this match into one of THE classic Wimbledon Finals!